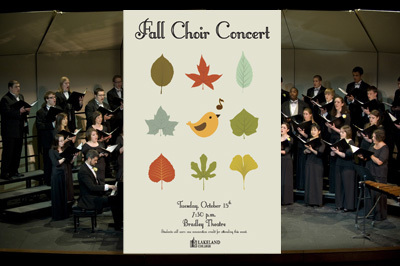 The Lakeland College fall choir concert will offer a variety of music that will not only challenge the singers, but will also entertain the audience. The concert is set for Tuesday, Oct. 15, at 7:30 p.m. in the Bradley Theatre on Lakeland's main campus. The concert will mark Lani Knutson's first concert as the visiting instructor of music and director of choral activities. She joined the college last year as an adjunct director, and stayed on this year after the retirement of Professor Janet Herrick. Knutson came to Lakeland after serving as music director for the Milwaukee Montessori School and music director of the Cantare Chorale in South Milwaukee. The concert will include performances from three Lakeland College choir groups: the Frauenchor (women's chorus), the Concert Choir and the Lakeland Singers. The Frauenchor will open the concert performing a mix of folk songs, a Renaissance piece and a new work, "I Started Out Signing," by composer Jocelyn Hagen. This will be the first time the Lakeland Singers, a group that generally performs at churches in the region, is part of the fall concert. They will perform one of the pieces that is part of their church repertoire, as well as an old jazz standard, "Let's Call the Whole Thing Off." The concert choir will perform a fast-paced piece by Brazilian composer Ernani Aguiar, two choral standards – "Cantique de Jean Racine" and "Musicks Empire" – a King Singer's arrangement of "You Are the New Day," a minstrel song adapted by Aaron Copland and a song in Swahili entitled "Amani." Knutson said she the program provides a wide range of music for concert-goers, and some changes for audience members familiar with Lakeland's program. Katie Christensen, a sophomore from Sheboygan, will accompany the Concert Choir, as Knutson wanted to award this spot to a student. The Frauenchor will be accompanied by Associate Professor of Music Arthur Johnson. The Lakeland College band offered a traditional Americana program last Wednesday, Oct. 2 at the annual Fall Band Concert. Under the new direction of director Christopher Werner, the program included John Philip Sousa's "Hands Across the Sea" march, William Schuman's "Chester" Overture, "October" by Eric Whitacre, Rover Jager's "Esprit de Corps" and the Lakeland College alma mater and fight song. Werner said he wanted to bring together themes from his background and that each piece represented something significant. Sousa, one of the early directors of the U.S. Marine Band, is known throughout America as "The March King," and his march, "Hands Across the Sea," is a not-often-heard gem in the band repertoire. "This piece was in scripted with the subtitle: ‘A sudden thought strikes me; let us swear eternal friendship,' and from this I take a smile and acknowledgement of the new friends I've made here and their helpfulness in my transition to Lakeland," Werner said. William Schuman's "Chester" is a full overture based on the Revolutionary War hymn by William Billings of the same name. Originally conceived for orchestra as a three-movement suite, the final movement, "Chester", got a band makeover in Wednesday night's version, which was a stable of the band repertoire. Werner also had direct ties to Whitacre's "October." It was written for a group of high schools and universities in Nebraska just before he arrived there to work on his doctorate. Headed by Brian Anderson, the band director at Freemont High School, the work has become an instant classic in the world of concert band. "To me, this piece tied in the entire program…friendship, education, time, sentiment," Werner said. "The title works chronologically, the themes work musically, it fit for homecoming and our band played the heck out of it." 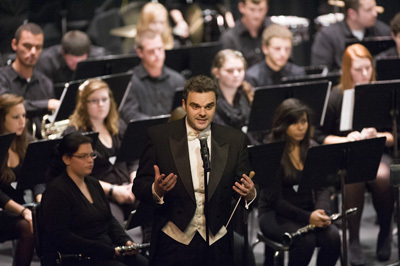 Prior to coming to Lakeland, Werner spent eight years as instrumental music teacher and music department chair at la Crosse Central High School He was conductor of the Central Wind Ensemble, pep band, Grand Central Station Show Band, instructor of music theory, and he team-taught the Red Raider Marching Band. He is president for the National Band Association-Wisconsin Chapter. He has twice been awarded the "Citation of Excellence" by the National Band Association-Wisconsin Chapter. Werner holds a Doctor of Musical Arts in Wind Conducting from the University of Nebraska. He has the distinction of being the first University of Nebraska DMA recipient of the Wind Conduction degree and also the first Hixson-Lied College of Fine and Performing Arts F. Pace Woods Scholar in Music. He also holds a bachelor's degree in music education from the University of Wisconsin-La Crosse and a master of music degree in wind conduction from UW-Milwaukee. Werner was active in commissioning new works for wind band. His Central bands participated in or organized consortiums with new music by several contemporary composers, and ensembles under his direction appeared at numerous state conventions in Wisconsin and Nebraska. He is an accomplished clarinetist, serving as assistant principal clarinet for the La Crosse Concert Band, principal/assistant principal clarinet with UW-La Crosse Choral Union and substitute assistant principal clarinet with the La Crosse Symphony Orchestra. Aimee Thrune, a Lakeland College senior from Prairie du Sac, Wis., is one of 46 winners nationally of a $5,000 Armed Forces Communications and Electronics Association (AFCEA) STEM Teachers for America’s Future Scholarship. 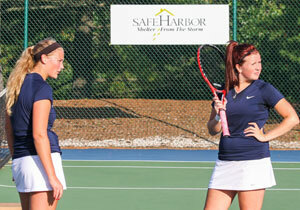 Thrune is majoring in math, Spanish and education at Lakeland. The AFCEA Educational Foundation offers scholarships of $5,000 to students actively pursuing a degree for the purpose of teaching STEM (science, technology, engineering or mathematics) subjects at a U.S. middle or secondary school. Thrune is a standout performer in the classroom, and an active leader and participant in a number of campus activities. As a junior, Thrune was named the college’s Mathematics Student of the Year and received Who's Who of American Colleges honors. This past June, she studied abroad in Columbia, and taught basketball to a group of Columbian students in their gym class. She also tutors area high school students. She is a three-year letterwinner on the Lakeland women’s basketball team, and this year is serving as a team captain. She is also on the golf team. She is president of the Student Athlete Advisory Committee, president of Math Club, treasurer of the Spanish Club and a member of the Lakeland College-Community Activities Board and Student Association. She works as a resident assistant for Morland House and as a campus ambassador for the college’s admissions department, giving tours to prospective students and parents. In addition to this scholarship, Thrune also receives the Kuehn Achievement Scholarship.